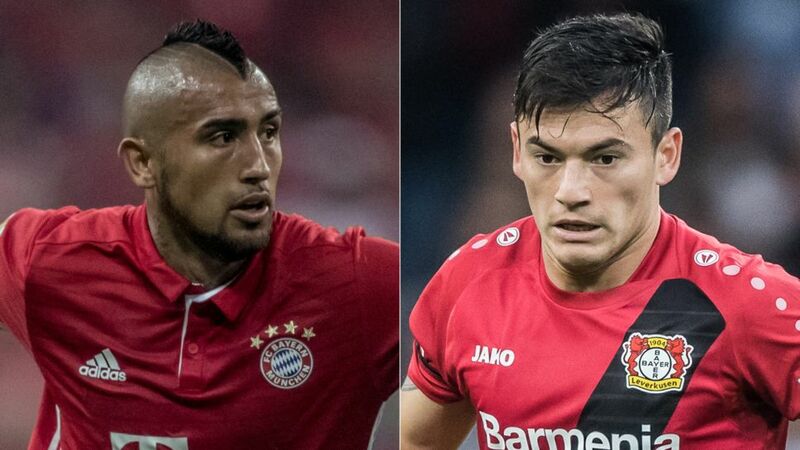 Midfield maestros Arturo Vidal and Charles Aranguiz have played a central role in Chile's recent Copa America successes, but they will be on opposite sides of the park when Vidal's FC Bayern München host Aranguiz's Bayer 04 Leverkusen on Saturday (kick-off 18:30CET/17:30GMT). Got space for Vidal or Aranguiz in your Official Fantasy Bundesliga team? Sign them up here! The Bundesliga has become a happy hunting ground for Chilean internationals in recent seasons, and two of the country's biggest stars are set to go head-to-head in a mouth-watering clash at the Allianz Arena on Matchday 12. Vidal and Aranguiz are key components in the 4-3-3 employed by Chile coach Juan Antonio Pizzi, usually slotting into midfield either side of former Hamburger SV man Marcelo Diaz. They have both had a hand in making the last few years the most successful in La Roja's history, with successive Copa America titles in 2015 and 2016. One man who knows a thing or two about the benefits of Chilean influence is Leverkusen sporting director Rudi Völler. The Bundesliga legend – a World Cup winner with West Germany in 1990 – was instrumental in bringing Vidal to the BayArena in 2007, before securing Aranguiz's services in 2015. "We noticed how talented Chile players were just in time, when we signed Vidal," Völler explained. "They have more versatility on the pitch, and a very aggressive style that is recognised throughout the world." Vidal was soon turning heads with his eye-catching performances as a box-to-box midfielder for Die Werkself, and was snapped up by Juventus FC in 2011. Four years and four Serie A titles later, he returned to the Bundesliga, helping Bayern secure a record fourth consecutive league crown. With over 150 appearances under his belt, Vidal is already something of a Bundesliga veteran, and Völler believes that he and other Chile internationals – including TSG 1899 Hoffenheim's Eduardo Vargas – have progressed during their time in Germany. "The Chilean players make the Bundesliga an even stronger and more attractive league," he noted. "But at the same time, they benefit from the Bundesliga." Plagued by injury problems last season, Aranguiz only became a regular starter for Leverkusen in April, but it didn't take him long to settle in. In five starts at the end of 2015/16, he notched up two goals and two assists as Bayer finished third, securing a place in the UEFA Champions League group stage. "Aranguiz is a great player who is fast, technical and has endurance," continued Völler. "He is very versatile, and his sharp play has resulted in goals. We are very happy that he is with us." Vidal and Aranguiz both proved their mettle in Chile's maiden Copa America success, in 2015, converting penalties in the final shoot-out with Argentina to land their country's first major trophy on home soil. Both men were named in the Team of the Tournament a year later, at the Copa America Centenario, as lightning struck twice in the United States, with another shoot-out victory over Argentina in the final. Aranguiz, who also scored in the semi-final win over Colombia, coolly converted his spot-kick once again. Now, these two global stars will set aside their close friendship – for 90 minutes at least – as they face off for the very first time in the Bundesliga. Both Vidal and Aranguiz will be hoping to conjure up a bit of Chilean magic as they try to steer their juggernauts to victory at the Allianz Arena.